↑ "On Authority". Retrieved 13 September 2014. 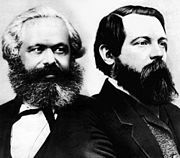 ↑ Karl Marx; Frederick Engels. "Manifesto of the Communist Party". Retrieved 13 September 2014. ↑ "Critique of the Gotha Programme—IV". Critique of the Gotha Programme. Retrieved 2009-10-18. ↑ Lenin, Vladimir (1918). "Class society and the state". The State and Revolution. Lenin Internet Archive (marxists.org). ↑ O.P.Gauba (2015). An introduction to political theory. New Delhi: Mayur paperbacks. pp. 607,608. ↑ Luxemburg, Rosa (1918). "Democracy and Dictatorship". The Russian Revolution. New York: Workers Age Publishers.